Les Expressions Corporate Services Pvt. 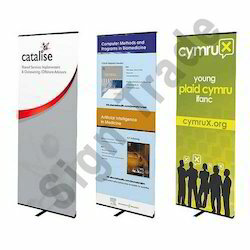 Ltd.
Our company holds immense experience in this domain and is involved in offering wide assortment of Roll Up Banner Stand. Adson Management Services Pvt Ltd.
Alligator stand for super market for keeping consumer goods this can be given with branding done on all both side and top (called side branding and head card branding) we are fabricator inform us the size and you can get it done. 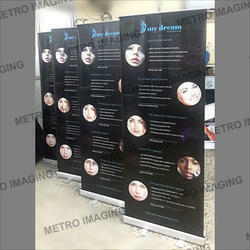 Retractable Banner Stand offered is made available in aluminium material finish and comes with carry bag support.